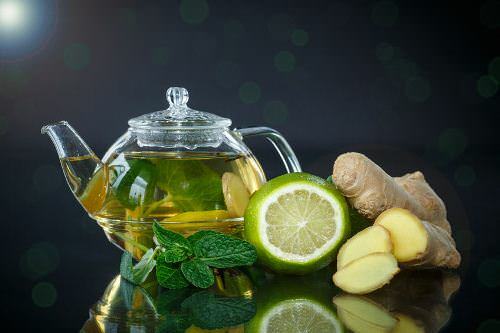 Gunpowder green tea with spearmint is a famous Moroccan drink that is a great digestive. If you’ve never tried this drink, you should definitely try it. Gunpowder tea is rolled into little balls which unfurl in hot water and release a slightly smoky, bitter infusion. Green ginger mint tea is also great iced. You can sweeten it with honey, if you want. Start with peeling rind from oranges or tangerines. Place them on rack and start slicing gingerroot into 3 mm (1/8-inch) thick slices, then remove some leaves from 2 bunches of spearmint. Place them on rack. Let dry 24 hours or until brittle at room temperature. Break into 2.5 cm (1-inch) pieces. Mix together green tea leaves, tangerine (orange) rind, mint leaves and ginger, and spoon into airtight jar or decorative bag.